We learn better in 3D, that’s how we experience the world. 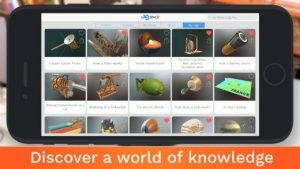 JigSpace is the platform to explore and share truly interactive, 3D knowledge for anything. When you ask “How does that work?” the answer is right in front of you, in beautiful, interactive 3D. Dive through dozens of Jigs, learn at your own pace, and satisfy your curiosity. And with the upcoming release of the Jig Workshop, anyone will be able to create Jigs and share them with the world. JigSpace empowers you to learn about the world in a way that simply wasn’t possible before. Coming Soon Create your own Jigs in the Jig Workshop and share them with the world!